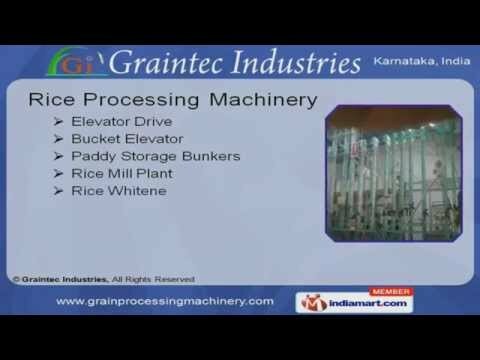 Welcome to Graintec Industries Manufacturer & Supplier of Rice Processing Machinery & Conveyors. The company was incorporated in 2009 at Bengaluru. With our State-of-the-art infrastructure & Quality- centric approach, we cater to East Asia, America, Middle East & other countries. Our Ethical trade policies, Cost effective prices & Customized packaging facility are some of the attributes of our organization. We offer a diverse range of Industrial Conveyors, Storage Bunkers, Cleaning Systems & Rice Processing Machinery. Elevator Drive, Rice Whitener & Paddy Storage Bunkers are available under Rice Processing Machinery. Our Industrial Conveyors are appreciated for their high tensile strength & corrosion resistance. We also offer Belt & Buckets that are highly acclaimed due to their excellent functionality and long lasting properties. Our clients can avail Storage Bunkers as per their choice and requirements at nominal rates. We bring forth an excellent range of Bucket Elevators & Cleaning Systems, that are fabricated from high quality raw material.